The coral island of Barbados is situated east of the other Lesser Antilles islands. From dramatic cliffs in the north, windswept Atlantic beaches in the east, and flat pastureland in the south to white sand beaches on the west coast, Barbados' varied terrain covers an area of 166 square miles. The central part of the island has tropical vegetation, cane fields, and villages. Barbados has a rich colonial past. It was once a British colony, with an economy based on sugar cane. These early sugar plantations led to the first Caribbean rum distilleries, including the oldest, Mount Gay. The capital city of Bridgetown features the Garrison Historical Area, the Barbados Museum, the Barbados Gallery of Art, and shopping on Broad Street. Other noteworthy historical buildings are St. John's Church, St. James Church, and Codrington College. Hsyndicate. Wednesday, 27 Mar 2019 12:10:47 +0200. The Prince of Wales (right), 70, looked smart as he met with singer Lionel Richie (left), 69, in Barbados on Tuesday night to name him as ambassador for The Prince's Trust. Daily Mail. Tuesday, 19 Mar 2019 23:42:16 GMT. Natural attractions in Barbados include the Welchman Hall Gully, Harrison's Cave, Grenade Hall Forest, and the Barbados Wildlife Preserve, where you'll find Barbados green monkeys, red-footed Barbados tortoises, toucans, and parrots. For those who enjoy botany, the Flower Forest has tropical plants and flowers. Casuarina trees and palms edge the sand beaches of the west coast Caribbean Sea. The Animal Flower Cave is at the north of the island. Sea Anemones grow in pools on the floor of the cave. At the Folkestone Park and Marine Reserve, visitors can learn how a coral reef forms. Barbados beaches are all public, drawing people from the large hotels and elsewhere. The west coast white coral sand beaches are called the Platinum Coast, and landscaped hotels line this beach area. 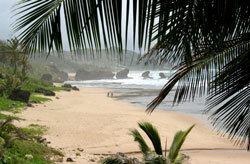 Other beaches, such as Bathsheba, are treacherous for swimming, but are appreciated by experienced surfers. Scuba divers can enjoy reefs and shipwrecks around the island. Tourists will find a large selection of dining facilities on the island. While eating gourmet, bistro or authentic island food in an island ambience, Calypso, soul, or jazz music may be featured at the restaurants. Make sure you try the local specialty, fried flying fish, on your next visit to Barbados!